Nahrin AG is specialized in high-quality bouillons, spices, and food supplements. 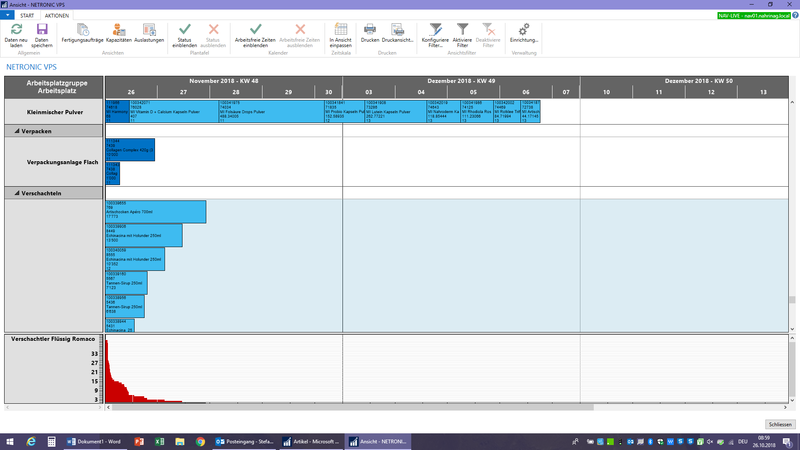 The Swiss food manufacturer asked their Microsoft Dynamics NAV partner Alpha Solutions AG for a visual overview of their orders, including the labeling of two criteria: a gradation from sweet to salty and from fair to dark. "We produce from sweet to salty and at the same time from fair to dark. If we don't keep this sequence, we have to do an intermediate cleaning of our machines, and this takes time and money", says Martin Voegeli, project manager ICT. Their partner Alpha Solutions knew that in the Visual Production Scheduler most of the desired overview and planning support was already realized and the necessary visualization of the labeling was done by NETRONIC. After less than a year, the machine utilization has improved by 20 %, thanks to visual planning. Nahrin AG sells their products successfully via a net of independent sales representatives who enter their orders directly by app into the ERP system. Moreover, the products can be directly obtained in the company's online shop. Both sales channels require 100 per cent readiness for delivery. In addition to their own portfolio, Nahrin AG more and more produces goods according to the individual recipes of customers which afterwards will be sold under the customers' own brand name. Of course, these goods have to be included in the planning for Nahrin AG's own products. The manufacturing process comprises production phases of five weeks each. After each production phase, the complete production plant will be cleaned to prevent taste or color impurities. Nahrin AG's own goods are produced to stock. To determine the production orders of a period, the forthcoming sale gets estimated by the sales figures of the past year and are compared to the current stock. Due to his long-time experience, the responsible production manager was able to optimally plan the sequence of the internal orders according to their taste and color characteristics. The increasing number of online orders and orders for goods with individual customer recipes also mean increasing planning requirements: The so far mere (and stable) make-to-stock production has to be enhanced by order production. This means, that planning the order sequence not only has to take into account taste and color characteristics but also meeting the promised delivery date. In the past, this increased planning volatility required frequent intermediate cleaning of the machines to deliver the order on time. The planning board shows all orders of a planning period arranged one below the other at the according due date. 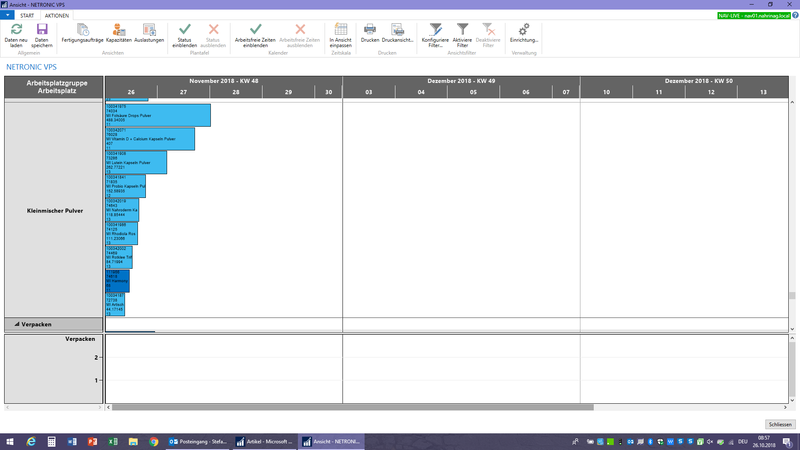 The planner drags the orders to the time line. As the labeling clearly indicates the level of sweetness/saltiness and fainess/darkness of a product, the temporal assignment in the sequence is very easy and safe. The yellow marked numbers at the bottom of the bar are the numeric code for the production order. The numbers 11 to 15 indicate the sweet products from fair to dark, the numbers 21 to 25 indicate the salty products from fair to dark. "The planning suddenly became independent of our production manager, because the overview now allows actually everyone to plan the orders. In addition, the planning process has become significantly quicker. Today, the orders are being planned by an employée within a few hours so that our production manager has more time to look after our production plant." 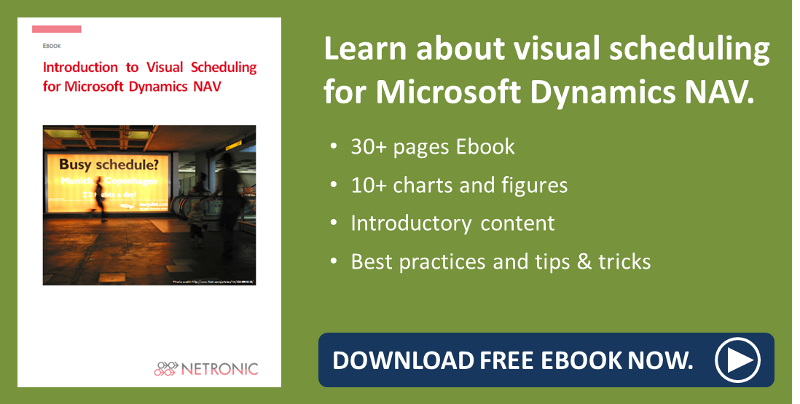 "NETRONIC's Visual Production Scheduler is an easy-to-implement and easy-to-use visual planning board for Microsoft Dynamics NAV. This simplicity and the concentration on visual planning that is transparent for the user adds a tremendous plus to this tool."